Landscape Architecture Bureau designed the interior landscape and the upper roof terrace of this office building in downtown Washington, DC. PNC Place is the largest LEED Platinum office building in the city and only the second to achieve that level. As such, some quite innovative approaches to mechanical systems were used. The interior green wall in the lobby is used not only to make the building a more pleasant place but also to filter return air for the HVAC system, humidifying it and reducing particulates. The green wall is composed of only a three species to simplify maintenance and to create a subtle banding pattern as seen from the upper lobby. Recycled water is used extensively throughout the project, irrigating both the green wall and the 15,000 sf roof through a sophisticated drip system. 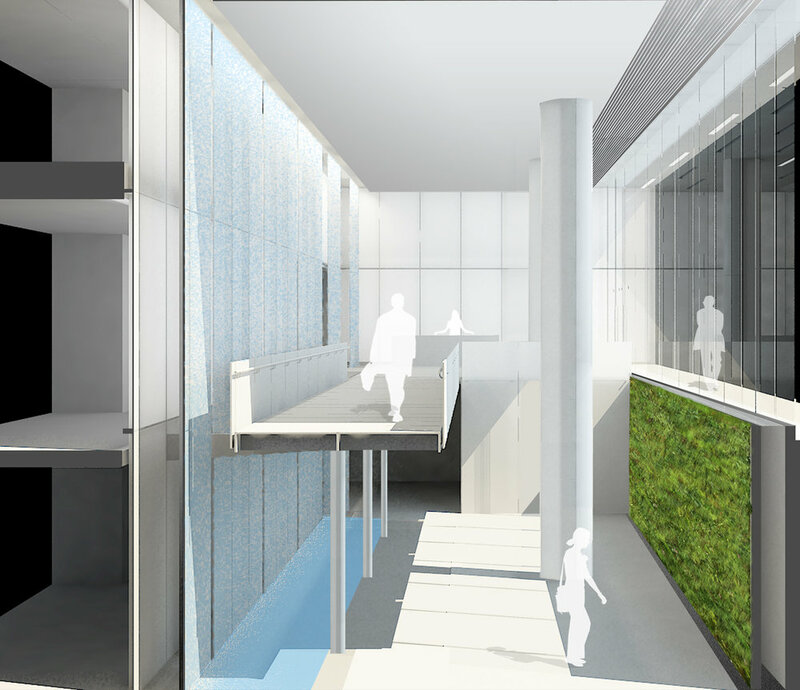 A three-story high water wall showcases water as it runs down a thin stainless steel mesh.